What Will WTO Membership Mean for Laos? Laos’ recent WTO membership stands to benefit the country significantly. But the gains will take work. Fifteen years after Laos first sought membership in the World Trade Organization (WTO), the small landlocked Southeast Asian state finally became the global trade body’s 158th member on February 2, 2013. While many have touted the benefits of WTO membership for Laos, Vientiane must grapple with several formidable challenges to realize these benefits in the coming years. WTO membership is the latest in a series of steps Laos has taken to increase its global profile. Other initiatives included establishing a stock market in 2011 and hosting the Asia-Europe Meeting (ASEM) in 2012. Building on these previous efforts, by joining the WTO Vientiane is binding itself to a political framework designed to help countries realize gains from trade. In exchange for lowering barriers and enacting other market reforms, it has been assured of favorable trade terms and increased market access for its goods. Ideally, these changes will help boost its U.S. $8 billion dollar economy, which has grown by more than 7 percent annually over the past decade. 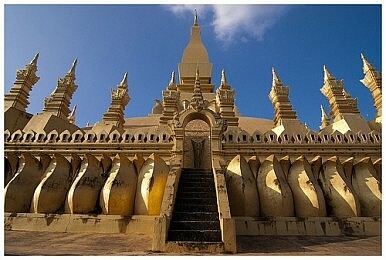 Laos will also be able to diversify its list of trading partners, which is now dominated by Thailand, China and Vietnam. Membership could also enhance Vientiane’s geopolitical clout. As part of the WTO, tiny Laos, with a population of just over 6 million, can improve its bargaining position with larger counterparts by forming alliances within the grouping and using the body’s dispute resolution mechanism to prevent discrimination it would otherwise be powerless to stop. Laos’ commitment to abide by the WTO’s market access rules also increases its level of predictability in the eyes of corporations assessing the risks of investing in frontier markets. In fact, Vientiane hopes to attract U.S. $8 billion in investment between 2011 and 2015 in a bid to graduate from the UN’s list of Least Developed Countries (LDCs), where it has remained since 1971, by 2020. Roughly a quarter of Laos’ population still lives below the poverty line, and the country ranks a dismal 138th out of 187 countries in the UN Human Development Index. More broadly, WTO membership for Laos will arguably benefit all ASEAN member countries. With Vientiane’s entry, every ASEAN member country is now part of the global trading body. Brighter economic prospects for Laos, combined with Myanmar’s recent opening, adds momentum to the grouping’s goal of forming an ASEAN Economic Community by 2015, which would bring 600 million people, or around one-tenth of humanity, into a shared economy with an estimated worth of more than U.S. $2 trillion. But if Laos wishes to realize the full potential gains of WTO admission, it must overcome several major obstacles. First of all, it must diversify its economy by shaking off its overwhelming dependence on China, Thailand and Vietnam. This is easier said than done. The three countries alone accounted for nearly 80% of Laos’ imports and 70% of its exports in 2011, and about 60% of all foreign direct investment in the country in 2010. Laotians are especially concerned about China’s growing footprint in the country. Beijing has led a string of large-scale infrastructure projects, sparking labor, land, environmental and macroeconomic concerns. A planned U.S. $7 billion, 260-mile Chinese railroad, for instance, which would be the largest infrastructure project ever in Laos, has come under scrutiny by experts who warn that the financing terms offered by China’s Export-Import Bank to Laos were so onerous they put its “macroeconomic stability in danger”. Laos also needs to avert the so-called resource curse. More than half of Vientiane’s total wealth comprises natural resources, a dependency that may foster impressive short-term economic growth but could also compound governance problems and exacerbate already high levels of poverty and inequality. A recent study found that natural resource development not only led to widespread resettlement and worsening food security, but prevented Laos from improving on several key human development indicators such as education and health. Several other sectors of the economy also need development. Although rice farming is the single most important economic activity in Laos, accounting for about 40 percent of its agricultural GDP, the government announced last month that rice production had fallen short of targets for the second consecutive year, undermining its goal of becoming a rice exporter by 2015. Textiles are the biggest export in the Laos’ growing manufacturing sector, but chronic labor shortages may prevent the country from meeting its target of tripling clothing exports over the next three years. Indeed, Laos has a long way to go towards cultivating a business-friendly environment. The country is notorious for its underdeveloped infrastructure and rampant corruption. Weak rule of law and frequent government intervention expose foreign businesses to high political risk. In one high-profile case, Macau-based Sanum Investments sued the Lao government last year over U.S. $23 million in taxes and penalties levied at it. The firm alleged that judicial and tax authorities were colluding with well-connected Lao families and companies to expropriate its businesses. The country’s image has continued to take a beating in recent months, despite government efforts. In December, Sombath Somphone, Laos’ most prominent activist, disappeared, prompting the UN to express concern and activists to pressure ASEAN to speak out against government repression in Laos. Such repression persists in Laos against religious groups, farmers who lodge land-grabbing complaints, and political opponents. Just last month, international donors issued a sharply-worded statement to Vientiane for its plan to proceed with the massive Xayaburi Dam project along the Mekong River. According to the statement, the Lao government has not adequately consulted its neighbors or fully considered the potential risks and adverse impacts of the dam. To be sure, these challenges do not diminish the positive impact that will come from Laos’ entry into the WTO, which is itself a tremendous achievement for a rapidly growing economy. What the issues do indicate is that translating the potential benefits of WTO membership into actual gains will not be an easy task for the government over the next few years. Laos seems on the brink of reaching an important milestone. What happens next may be of even greater importance.